One of these GPU specialists will fall hard when the cryptocurrency catalyst fizzles out. 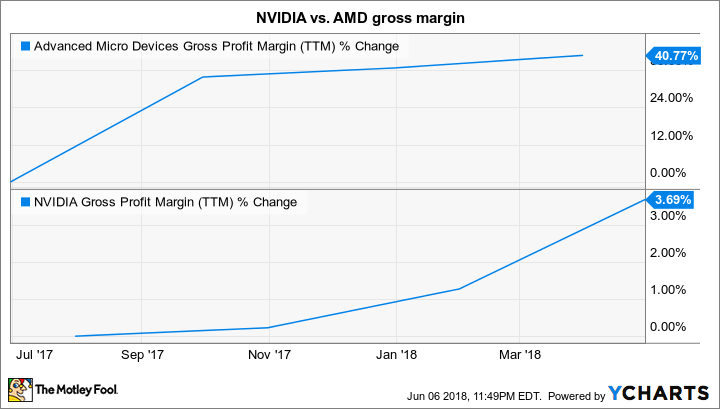 Cryptocurrency mining has turned out to be a big catalyst over the past year for graphics cards manufacturers Advanced Micro Devices (NASDAQ:AMD) and NVIDIA (NASDAQ:NVDA). Jon Peddie Research estimates that cryptocurrency miners bought $776 million worth of graphics cards in 2017, and AMD was the bigger beneficiary of the two. AMD has said that it got 10% of its total revenue in the first quarter from cryptocurrency mining. Given its total revenue of $5.3 billion last year, that would indicate it cornered roughly two-thirds of estimated cryptocurrency-related GPU sales. NVIDIA also said that cryptocurrency miners drove nearly 10% of its GPU sales last quarter. Cryptocurrency mining also created a massive supply shortage that led to a sharp rise in GPU prices. So AMD and NVIDIA have benefited in more than one way from crypto-driven GPU demand. But they're about to lose this tailwind very soon. NVIDIA sold a remarkable $289 million worth of graphics cards to cryptocurrency miners last quarter, exceeding its own $200 million expectation. But the company expects sales of graphics cards to cryptocurrency miners in the second quarter to drop to just a third of the first-quarter levels. There could be two reasons why NVIDIA is forecasting such a massive drop. First, a dedicated cryptocurrency mining chip is about to hit the market. Bitmain, a Chinese manufacturer of cryptocurrency hardware, has developed an application-specific integrated circuit (ASIC) to mine Ethereum, and it expects to start shipping it in July. Bitmain has priced this ASIC-powered mining rig at $800, while GPU-powered rigs can sometimes cost thousands of dollars because of expensive graphics cards. Cryptocurrency-mining-driven GPU demand will likely tail off thanks to the presence of such alternatives. Second, GPU prices have started normalizing thanks to improved supply. The price of NVIDIA's top of the line GTX 1080 Ti GPU has dropped nearly 38% in just two months, and the company's entire GPU portfolio has seen similarly massive price cuts in recent months. AMD hasn't escaped such price drops either. The RX 580 8GB graphics card, for example, has shed 28% of its price in the past two months. AMD is also witnessing across-the-board price drops, with its high-end GPUs, such as the RX Vega 64, losing almost a third of their value in just one month. Looking ahead, GPU supply looks set to increase further, as NVIDIA recently launched a budget graphics card to cater exclusively to gamers. The GeForce GTX 1050 3GB graphics card isn't powerful enough to meet the requirements of cryptocurrency miners, and is expected to be priced between $140 and $200. So the time of sky-high GPU prices is possibly coming to a close. But how will this development impact NVIDIA and AMD? GPU prices started skyrocketing around April last year. The prices kept on rising for the remainder of 2017, and on into early 2018 before a correction began in April this year. So AMD and NVIDIA enjoyed a period of abnormally high GPU prices for nearly a year, and one of them saw a big boost to gross margin in this period. AMD, on the other hand, has brazenly cashed in on the cryptocurrency trend. Just recently the company updated some of its GPU driver software to improve cryptocurrency mining efficiency. This wasn't the first time AMD released a driver update to aid crypto mining. The company had done the same in August last year when demand from miners was booming. The drop in cryptocurrency demand will hit AMD harder. In fact, the company admitted in its latest 10-K filing that its "GPU business could be materially adversely affected" in the case of a decrease in demand for cryptocurrency mining. On the other hand, NVIDIA has a lot going for it beyond cryptocurrency. It is pursuing growth in fast-growing end-markets such as video gaming hardware, artificial intelligence, self-driving cars, and data centers. AMD, however, doesn't enjoy such exposure to next-generation markets, as it relies primarily on PCs and gaming consoles for its growth.